Bathtime is the kids favourite time of day. C is now almost 3 and in that time, he has a pretty impressive collection of bath toys. We would just store them in a plastic box with holes in the bottom which wasn't the best! 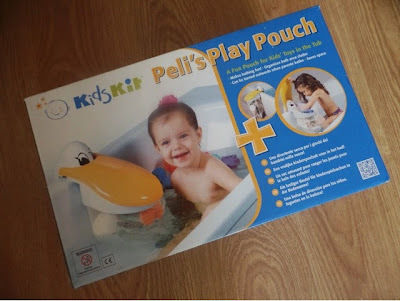 We received the Kids Kit Peli Play Pouch Tidy Net Storage from BabyThingz and I honestly thought that there was no way that it would fit all of C and E's bath toys. 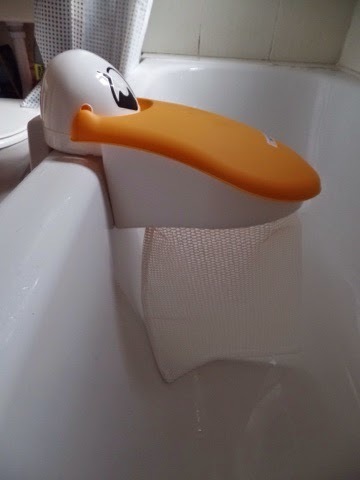 The pouch was easy enough to put together the main plastic bit sits easily onto the side of the bath and the net slots in. It can either face in the bath or out if it takes up a bit too much space whilst your children are bathing. To my surprise, all of the kids toys did fit in with extra space for more! The lid opens and closes easily so C was able to get his toys out then put them back in to tidy up by himself. 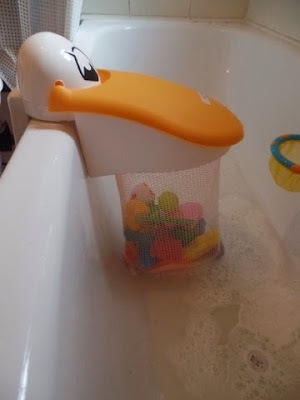 The plastic means that it can be cleaned easily and the net ensures that excess water is drained off of toys. We haven't had any incidences of either the toys or net going mouldy so that's a win in my book! The Peli Play Pouch retails at £15.95 and you can purchase it directly from BabyThingz. You can also follow BabyThingz on Facebook and Twitter.